Everybody enjoys a good bit of laziness from time to time, but it’s not always the most attractive position to be in. Same could be said about the wonderfully named kitchen gadget called the lazy susan. All too often however, they just don’t seem to be made for everyday use. No so with the MIU Stainless-Steel Lazy Susan. Featuring a silicone surface and stainless-steel construction, the ball-bearing driven tabletop accessory enhances the surroundings rather than detracts from them. 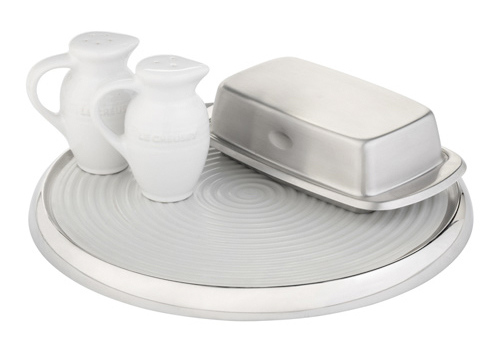 Measuring a little over 11-inches across and 1-inch tall, the heavy (it weighs over a pound) gizmo offers a convenient place to store everyday tabletop essentials like salt and pepper. Or, for those feeling really lazy, their dinner plate would fit right on top.